After seeing selfie sticks all over, I decided to finally purchase one for my family. I tend to do a lot of research to find the best devices for my money instead of going to the nearest convenience store and buying one off the shelf. I came across the Mpow Selfie Stick and after reading multiple reviews, I decided to give it a try. The first debate I had was deciding whether I should buy a selfie stick with a bluetooth shutter or one that uses the headphone jack. As an iPhone family and the recent release of the iPhone 7 without the headphone jack, I decided to get a bluetooth selfie stick so that it could be used with an iPhone 7 without the use of a lightning adapter. The downside to using a bluetooth selfie stick is that it requires charging. The Mpow Selfie Stick has an auto-shutoff feature to save on battery and I have not needed to recharge it yet. It also uses a standard micro-USB cable for charging. 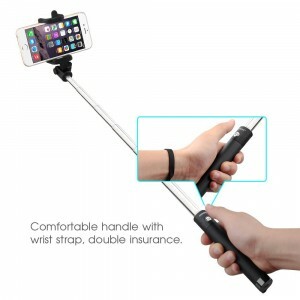 The Mpow Selfie Stick offers maximum compatibility among devices by using a bluetooth shutter and the camera holder expands enough to hold larger devices like the iPhone 6S Plus. It is rated to hold devices ranging in width from 2.2″ to 3.3″. This selfie stick collapses to down to 7.1″, making it small enough to store in a purse or bag. For the ultimate selfies, it expands to 31.5″ in length. The only downside to using a bluetooth selfie stick is that it will require charging on occasion. The battery seems large enough to go long periods of time without needing a charge and charging is quick. You can charge it using any standard micro-USB cable. Most people use their phone in landscape mode for selfies, but there could be a time where you’ll want to use it in portrait mode. Unfortunately, the Mpow Selfie Stick can be a little unstable to hold with your phone in portrait mode. The balance is off since the weight will shift to one side. Sometimes pressing the shutter button will take multiple photos. Coming in under $20 on Amazon Prime, you can’t really go wrong with the Mpow Selfie Stick. It offers great compatibility among devices and has a sturdy build that should stand the test of time. Have you used the MPow Selfie Stick? We would love to hear your opinions. Please ask any questions you may have and I’ll do my best to answer based on my experiences.